Categories: Bhakti, Divine Names, Guru, Spirituality. Sage Narada is generally considered a mischief-monger and a troublemaker by many casual readers of our Puranas. It is believed that wherever he appears, confusion and perplexity follow; and he is said to be one who revels in creating kalaham (conflict). However, the fact is that the only kalaham that Narada does is that he first approaches one who has absolutely no worthy attributes and stimulates him to seek God—be it Kamsa, Ratnakara, Dhruva or Prahlada. By initiating Prahlada into the name of Narayana and speaking to him about the glories of the Lord, even while he was in his mother’s womb, Narada ensured that the child was born a jnani who, even as a little boy was the greatest of all devotees. 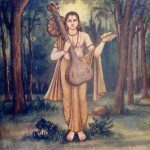 By accosting little Dhruva who was headed to the forest to see the Lord, Narada instructed him step-by-step on what he should do to behold the Lord. In fact, Narada described the glorious Lord in such great detail to the little boy that when the Lord actually appeared in front of him, Dhruva saw Him exactly as Narada had described! Narada was responsible for transforming the depraved hunter Ratnakara into the most esteemed Sage Valmiki simply by making him chant the name of the Lord, “Rama”. Even in the case of Kamsa, by revealing to him that Krishna was the eighth son of Devaki, Narada actually sent him towards the Lord and hastened his salvation. Narada is no normal deva traversing the skies! The author of the Bhakti Sutra, he is indeed the father of bhakti (devotion). With the Lord’s name constantly on his lips, he is among the foremost and favorite devotees of the Lord; he is the Lord’s confidante who often serves to further His avatara karyas (purpose of incarnation); he is an uttama Guru who, as we saw, leads many a jiva (soul) to the Lotus Feet of the Lord; and furthermore, Narada also plays the role of a guide to other great rishis who are his own peers. Narada was single-handedly responsible for inspiring the “documentation” of the lives of the two foremost avataras of the Lord: Sri Ramavatara and Sri Krishnavatara. When Sage Valmiki was contemplating deeply whether an ideal and perfect man really existed, it was Narada who came to him and told him the story of Sri Rama’s life, thus inspiring Valmiki to compose the Ramayana. At the end of the Dwapara Yuga, Sage Veda Vyasa , himself an incarnation of the Lord, felt restless about the future of mankind despite having compiled the Vedas, Upanishads, seventeen Puranas and even the Mahabharata. 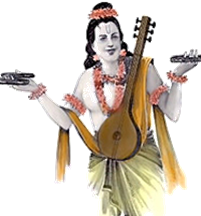 At this juncture, again it was Narada who came to him and advised him to write a grantha that glorified the Lord in a manner that would evoke the sweet feeling of bhakti in the reader. 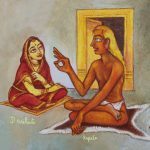 On Veda Vyasa’s request, Narada also narrated how he himself had earned devotion in his previous birth. He said that, as the little son of a servant maid, he had had the great fortune of serving the sadhus in his village through his mother’s blessings. 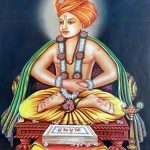 It had been simply through the sheer grace, compassion, and by eating the ucchishtam (sacred food remnants), of these sadhus that he had developed great dispassion and an overpowering desire to seek the Lord. The Lord had granted him a brief darshan in his heart in that birth, due to his having served the sadhus, but He had withdrawn His form saying that the boy was only eligible for that brief vision in that birth. However the Lord blessed him, so that in his next birth as Sage Narada, he does no arduous penance but instead constantly only chants the name of the Lord. And, while in his earlier birth that Lord went away from him, in this birth, the Lord constantly follows him and does not move away even for a second! 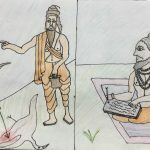 Thus inspired by Narada’s story, Veda Vyasa authored Srimad Bhagavatam, the crown jewel among the Puranas, that extols not just the Lord’s lilas in His colorful Krishnavatara, but also the inspiring life stories of His foremost devotees, while laying down Nama sankirtan and katha shravanam as the basis of developing true love for the Lord. Thus Sage Narada appears to be almost single-handedly responsible for showing posterity (i.e., us) a way to the Light in this dark and depressing Kali Yuga. How then can we label this great redeemer of the world as a mischief-monger or troublemaker? 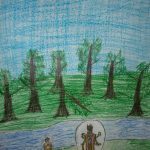 2 Responses to "Sage Narada: Mischief Monger or Divine Guide?" We have to get inspiration from Sage Naradji for spreading Bhagawan Nama.